In the year is 1793, France cowers under the Reign of Terror, and not even the innocent are safe from the guillotine. In the midst of this turmoil, one man uses courage and cunning to fight the brutality. 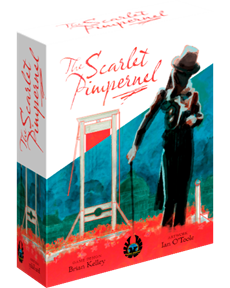 Join The Scarlet Pimpernel on his daring adventures in this beautiful new euro strategy game! Become a Member of League and Sir Blakeney's trusted advisor through Kickstarter, during final weeks of the crowdfunding project.